Specialist markets/sectors: All sectors in the Plastic industry. Product range Detail: A range of Flat Bed, Swan Neck and inclined conveyors, with constant or variable belt speeds. Conveyors can be fitted with seperators or Metal detection. Extruded aluminuim profile is used for sturdy construction and anodised for a hard protection finish. Box or bag storage sytems utilising the conveyor can also be offered. We also offer bespoke conveyor and handling systems. Other useful information: Bespoke systems designed and built. Options for belt protectors and side walls, including extra high walls in part discharge zone and adjustable side rails. Options for belt material (including FDA approved) and flights. Addition of Part Separators, including Drum, Spiral and Paddle designs. 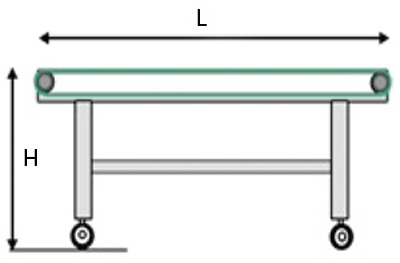 Rotating table and multi-level filling systems. Integrated coling tanks for thick walled components. Additional services provided: Jenco supply a huge range of ancillary equipment for the Plastics Sector. You can see our entries for Material Handling, Material Drying and Material Storage in the relevant sections of the PlastikCity site or on our own Website. Product range Detail: In addition to a comprehensive range of flat bed, incline and articulated conveyors, we offer customisation of e.g. belt type, speed / indexing, part chutes, the addition of component separators, (paddle, roller etc.) and even part counters / bagging stations etc. Product range Detail: 1000 Series Conveyors have PU/PVC belts and include standard duty flat bed conveyors with lengths up to 7 metres, heavy duty flat belt models up to 10 metres, as well as a full range of incline and articulated models. 2000 Series Conveyors use a modular plastic belt that is suitable for higher temperature (up to 125 degrees C) applications. Conveyors can be specified with a range of options, these including photocells, side wall and chute options, cooling, metal detection etc. Drum, Roller and Paddle component separators can be supplied either integrated into the output end of a conveyor, or on a separate stand. Our award winning team were the first to offer 24/7 availability, hold the highest number of regionally based engineers and have access to the highest volume of stock available on a next day delivery. We provide full integration and after sales services, backed by a technical team holding several centuries’ experience.